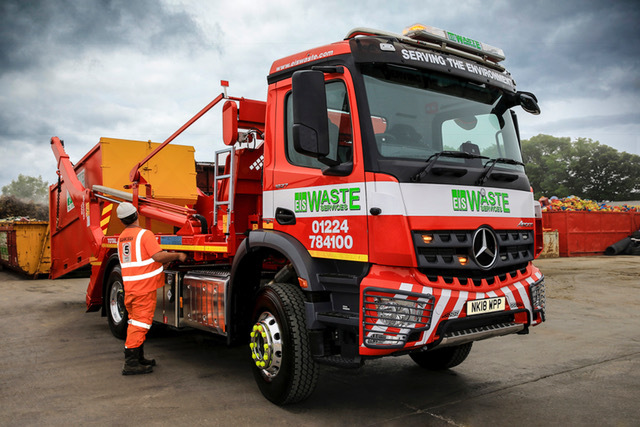 Aberdeen-based EIS Waste Services is looking forward to improved economy after commissioning Scotland’s first Mercedes-Benz Econics to be fitted with the manufacturer’s own, automated gearbox. Both 26-tonne Econic 2630 models, they were supplied by recently-launched local Dealer BLS Truck & Van, and feature advanced 7.7-litre, 220 kW (299 hp) straight-six engines which drive through smooth, 12-speed Mercedes PowerShift 3 transmissions. The new gearbox option has been introduced in response to demand from the market, and complements the established, six-speed Allison automatic. 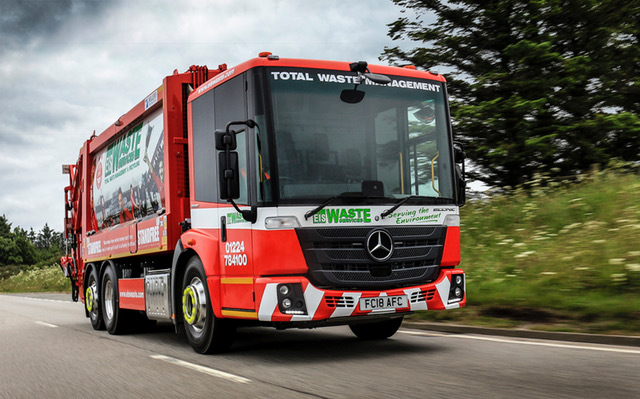 It reflects the increasing popularity among safety-conscious operators of the low-entry Mercedes-Benz chassis for distribution applications – while the Allison system remains best-suited to stop-start domestic refuse collections, Mercedes PowerShift is likely to be more appropriate to a trade waste operation that entails covering longer distances. 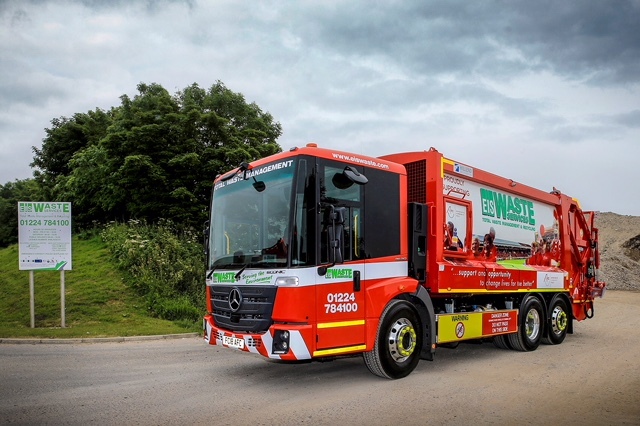 Like all Econics, EIS Waste Services’ new trucks are fully air-suspended and offer outstanding visibility, thanks to their deep, panoramic windscreens and the low seating position which allows drivers to make direct eye contact with vulnerable road users at junctions and in traffic. Both are fitted with compactor bodies built by Farid Hillend Engineering, of Dunfermline, and wear eye-catching liveries that underline the operator’s commitment to its home town – one promotes the Aberdeen Football Club Community Trust charity, the other Aberdeen Inspired, the Business Improvement District which represents over 700 city centre businesses. 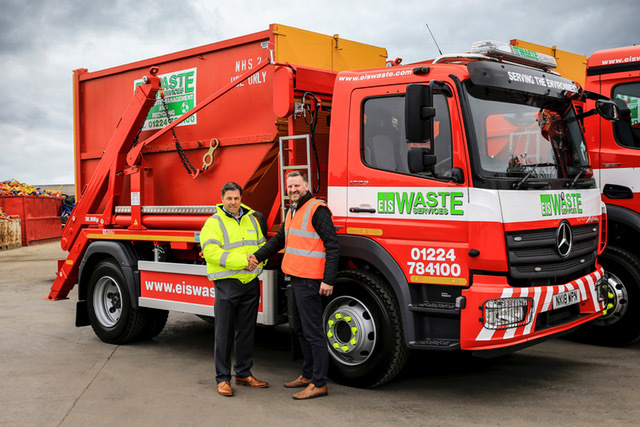 In addition to the Econics EIS Waste Services has just commissioned three 18-tonne Mercedes-Benz Arocs with Hyva skip-loading equipment. Two are 200 kW (272 hp) 1827 models, while the third, because it also pulls a drawbar trailer, is a more powerful 1836 variant with 265 kW (360 hp) straight-six. Completing the latest order is a 12-tonne Atego 1223, which has a 170 kW (231 hp) engine and is also fitted with Hyva gear. Although it also undertakes a proportion of domestic work, EIS Waste Services specialises in providing tailored waste management and recycling solutions to the construction, commercial and industrial sectors. Its clients include oil and gas businesses, shipping enterprises, engineering concerns and retailers, as well as universities, hospitals and Aberdeen City Council. 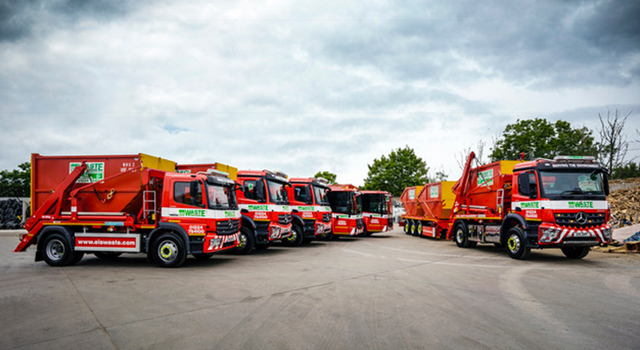 The company began trading in 1989 with a focus on recycling, after founder Neil Sharp – the father of the current Managing Director, also Neil – sold the skip hire and landfill business he had been running since 1974. Now 79, Neil Sharp Senior remains a director of the family business, along with his wife Edith and daughter-in-law Julie. 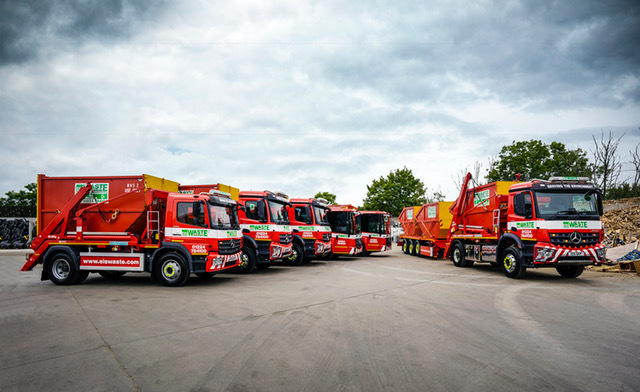 EIS Waste Services runs a fleet of 34 trucks in which Mercedes-Benz is the predominant marque –almost half of its vehicles wear three-pointed stars. The line-up includes four other Econics with Allison transmissions. Like their predecessors the two new versions are fitted with Vehicle Weighing Solutions (VWS) dynamic bin weighing equipment, as well as Brigade Electronics’ Backeye®360 bird’s-eye view recordable cameras and ultrasonic Sidescan systems. Neil Sharp observed: “Visibility from the Econic cab is exceptional and the fact that drivers sit at the same level makes it a lot easier for them to see cyclists and pedestrians. The vehicle’s enhanced safety credentials are obvious, and particularly applicable when we’re operating in the busy city centre. Purpose-designed for construction-related applications, the muscular Mercedes-Benz Arocs is ideally suited to skip work. EIS Waste Services’ three 18-tonners can each carry a skip with 16 cubic yard capacity. A determination to reduce fuel consumption and – by extension – cut emissions, also explains the company’s decision to invest in its first double-skip trailer. Pulled by the new Arocs 1836, this tri-axle unit was supplied by Hookmate, of Bristol, and is capable of carrying two more 16-yard skips. The 12-tonne Atego, meanwhile, has replaced a 10-tonner by another manufacturer and was chosen for the higher payload allowance that enables it to work with 14 cubic yard skips. 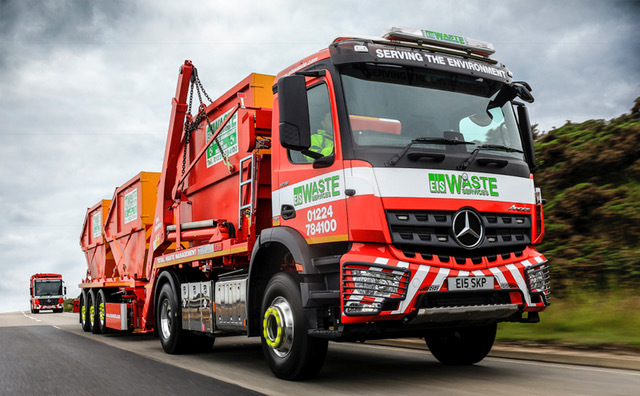 Like all road-going Euro VI Mercedes-Benz and FUSO trucks maintained under a Service Contract, EIS Waste Services’ Actros are covered by Mercedes-Benz Trucks’ Zero Tolerance on Downtime pledge. This assures operators that if their own vehicle cannot be repaired and set back on the road within 24 hours, they will either be provided with a like-for-like replacement, or reimbursed for the cost of renting one.